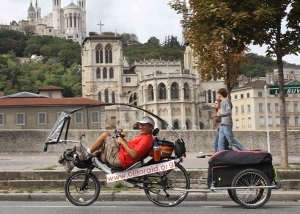 Since he started his "Tour of France" on his "bent bike" on August 9th, Hervé has already covered 1500 kilometers, crossing Angoulême, Nantes, Angers, Le Mans, Orléans, Troyes, Metz, Dijon and Lyon. He is now ready to go even farther South in the Mediterranean region. As a reminder, Hervé's dream is to support Clitoraid for the construction of our Hospital in Burkina Faso. So far he has sold fifty DVD's to get donations for the project and local media are also covering his event. The Clitoraid team salute his enthusiasm!